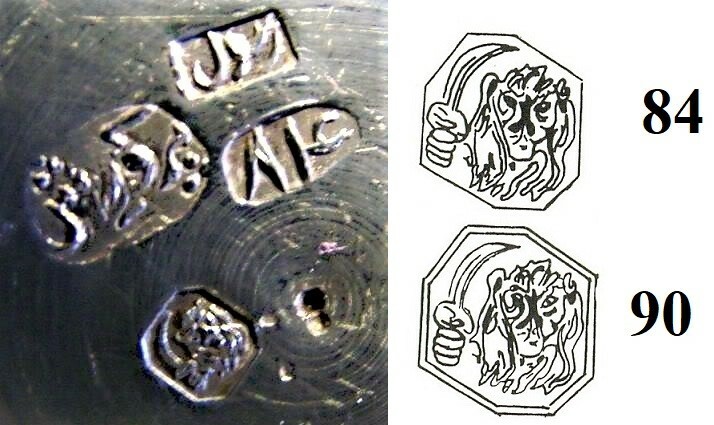 The mark on the right are the arabic figures for 84, a russian silver fineness mark for 875/1000 also used in Persia, but attention there are some experts here who say that it is not sure but it is possible that it is only low content silver. Cheryl is right. Persian 84 related to Russian Zolotniki is a myth.The standard was probably used in northern part of iran during Russian - British division of the country for a short time, but that ended 100 years ago.Later production in .840 fineness is marked as such, e.g. "Made in Iran, 84% MARTIN " Pay attention to percentage.Anyway, it would be interesting to test 84 items (electronically). Might add that while it's a less common fineness, Iranian .900 silver is also usually marked as '90', though not often in European-style numbers. The '84%' mark shown below is from Rezazadeh's 'Collectible Silver Jewelry' (2001), the maker's mark described as belonging to the 'Ardokhanian' family, silversmiths dating back to the 19th century, with a workshop in Tehran since at least the 1930s. Yes, they are solid silver. There are many silver standards (fineness) of silver alloys. Contrary to solid silver, silver plated items are made of non-precious base metal and covered with microscopically thin layer of silver, but that`s another story. In a word, your salt, pepper shakers ARE silver. Really interesting to read all the comments. Just love to learn the origin of items. I tested my vase posted under "Silver from Iran?" (in Middle East) electronically and the result was: at the side 88,7% and on the bottom 86,9% silver. No way they used different alloy on the same piece.Even industrial, serious X ray fluorescence is complicated and calculation of the average relative uncertainty is sometimes 2.5 %. Commercially offered analysers never offer margin of error data. At least good to know it`s solid silver close to .900.